March 17: Tracy Johnston Zager writes "A Brief Ode to Blank Paper," in which worksheets try to be helpful but turn out not to be. March 18: Mark Chubb asks, "So you want your students to have a Growth Mindset?" Answer: Yes. I also want teachers to have more than a superficial knowledge of growth mindset. Making a poster with the words "growth mindset" on it might not be helpful, and neither is telling kids that there's something wrong with them if they don't have it. Mark works through some of the misguided ideas we have about mindset and makes suggestions for how to do it better. March 19: Here's a post from last year rising again to the surface, which is a pretty good sign of quality: "#MTBoS Connected: Fraction Talks and WODB." It's good to see these kinds of cross-project connections. March 20: Want more Mark Chubb? Lucky for you, he's on a roll this week, this time with "Estimating - Making sense of things." March 21: Lisa Bejarano gave us all a little number talk advice: "It's the little things: How I improved student participation in number talks." Hint: It includes dropping something to signify you've made your point. March 22: I feel like we went a few months without Ben Orlin's bad drawings, but now he's on a hot streak. This week, it's "If Math Wrote Letters." Technically, this week only has hand-drawn text, not drawings, but I think it still counts. March 23: Brian Bushart hits kinda close to home with "Mathematically Correct," a blog post about his struggles in the state of Texas to acknowledge and hopefully fix an issue with a math question on their state exams. You see, I help with the PARCC exams and that makes me one of those people who, potentially, could catch problems like this before they go live on a test. However, I'm just one person, I usually just focus on a single grade, and the windows of opportunity to catch a problem like this are limited. It's frustrating to see an item that could be made better when it's not the right time to be improving items. March 11: Here's some art and math for you: "Artistic Expressions of Math Over Seven Centuries." March 12: If you want more links of the week, you can always check with our math ed friends in Ontario: Math Links for Week Ending Mar. 10th, 2017. March 13: I should really go back and watch this one: Peter Liljedahl presented "Building Thinking Classrooms" at the Global Math Department. March 14: The headline is "Rockies have perfect way to mark Pi Day," but those seeking the truth should know that yes, the uniform numbers were cleverly arranged with Photoshop. March 15: Ben Orlin is back with some poetic math fun: "Limericks for Mathematicians." March 16: First Peter Liljedahl, and now Nathalie Sinclair. It was a big week for Simon Frasier University. "SFU education professor Nathalie Sinclair named Research Mathematics Ambassador Award winner." March 3: What's MysteryGrid? If I told you, it wouldn't be much of a mystery, would it? March 4: People were buzzing about the "Beyond Answers Webinar," which has since passed. An archive is accessible for a fee. March 5: Here's Marilyn Burns with a blog post about playing a math game with second graders called, "Oh No! 99!" March 6: "Solving the Math Problem" is a video clip about some kids who attended a Youcubed summer camp. March 7: If you missed it on the 6th, it was back on the 7th by popular demand: "Solving the Math Problem." March 8: Ben Orlin asks, "How much of high school math would be easier if students understood that graphs express relationships between variables?" in his post, "Lines Beyond y = mx + b." I think of this as another example described by Sfard (1991), where learners need to make the leap from understanding something as a process to understanding it as an object. March 9: Warning: This will take more than five seconds. But maybe not much more. Dan Meyer writes, "The Difference Between Math and Modeling with Math in Five Seconds." February 24: Desmos announced that information about the Desmos Fellowship Cohort 2 would be coming soon. February 25: Gregory Taylor gives us a long and lively recap of a PD day keynoted by Peter Liljedahl. February 26: If you've ever wanted some of the PCMI experience but can't make it to Park City, the program does have a number of outreach programs that bring PCMI to the web and maybe even a city near you. February 27: The NCTM Annual Meeting program is here and the conference is right around the corner. February 28: I'd never heard of this mathy day, but this Scientific American article by Evelyn Lamb told me "How to Celebrate Fatou's Day." March 1: Self explanatory: Applications Are Open for Cohort 2 of the Desmos Teaching Fellowship! March 2: If you're looking for resources related to growth mindset, check out this Youcubed archive of papers, videos, handouts, and other materials. February 17: Amy Harmon wrote in the New York Times, "Equations and Inequalities: Math, Race and Fellowship," which later had the title, "Beyond 'Hidden Figures': Nurturing New Black and Latino Math Whizzes." Regardless of the title, the story is a great look at kids participating in a summer math camp in New York City, and the issues surrounding the underrepresentation of Black and Latino students in gifted and math programs. February 18: Didn't read it yesterday? Here's a second chance: "Equations and Inequalities: Math, Race and Fellowship." February 19: The big story today wasn't math, and wasn't politics, but instead was Susan Fowler's blog post, "Reflecting on one very, very strange year at Uber." February 20: The latest blog post from NCTM President Matt Larson is about "The Elusive Search for Balance. For more than 200 years in the U.S., the math ed pendulum has swung back and forth between procedures and understanding. The necessary difficulty, says Larson, is letting the pendulum come to rest somewhere in between. February 21: Dan Meyer explained "Why We're Suspicious of Immediate Feedback." It's a design principle at Desmos, where the key isn't immediate feedback, but feedback after a delay that provides for some productive contemplation. February 22: Shannon Najmabadi writes at the The Chronicle of Higher Education, "Meet the Math Professor Who's Fighting Gerrymandering With Geometry." This is about the person behind the Geometry of Redistricing program at Tufts mentioned a few weeks back. February 23: Jennifer Vadnais took the Marbleslides activity in Desmos and turned it into Mini Golf Marbleslides. Holes-in-one, only, please! It's a huge list of updates! Nominations for CCTM's 2017 Mathematics Teaching and Leadership Awards must be submitted by Sunday, March 5. Before teachers and leaders can be eligible to win these awards, they must be nominated. Once nominated, teachers and leaders will need to submit additional information to help the CCTM awards committee choose the winners to be recognized at next fall's CCTM conference. See the CCTM website for more information about the teacher award and the leadership award and to access the nomination forms. The next meeting of the Colorado Math Leaders will be the afternoon of Friday, March 10. This will be an important meeting because we will be voting to accept our new constitution and bylaws, which are necessary to become an affiliate of NCSM. We'll also be talking about officer elections for CML in addition to the usual professional learning and CDE updates. Watch the CML mailing list for more details. The March 1 early application deadline has passed, but you can still apply for the 2017 Summer Math Teachers' Circle Workshop in Durango, to be held June 12-16 until May 15, 2017. Register for any or all of the webinars in this series at http://www.cde.state.co.us/cdesped/sd-sld. More information about these and other professional learning opportunities from the CLDE office can be found on the CLDE website. Cassie Harrelson of Aurora Public Schools is facilitating an online book study of Jo Boaler's Mathematical Mindsets beginning on March 27 and lasting through May 7. The book study comes with credit and you can register for it on the COpilot website. Math teacher, interventionist, and coach Felicia Casto of Mesa County Valley School District 51 won the prestigious Milken Educator Award. You can watch a news feature about Felicia at http://www.nbc11news.com/video?vid=414708583 and more about her excellent work on her Milken Educator Award biography. Congrats, Felicia! Karen Karp at Math on the "Planes"
I was happy last week to join in on the fun at Math on the "Planes", the annual math conference hosted by the Colorado Council for Learning Disabilities. This year the workshops were led by Dr. Karen Karp of Johns Hopkins University. 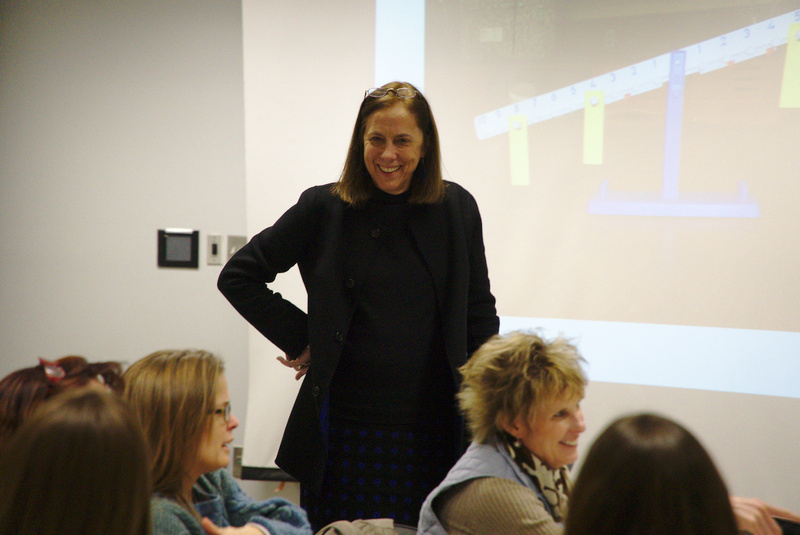 Friday's portion of the conference focused on tiers of instruction and intervention for K-2 students, while on Saturday the focus was on students in grades 3-5. This really is a great conference I hope everyone keeps their eyes open for Math on the "Planes" 2018. The application process for the standards review and revision committees is underway! CDE is committed to conducting an open and transparent review and revision of the Colorado Academic Standards by engaging diverse stakeholders to serve as committee members in each standard area. CDE is seeking committee members for each of the 10 content areas, English language proficiency, personal financial literacy, and computer science to provide revision recommendations to the State Board of Education. According to Colorado state law, the Colorado Academic Standards must be reviewed and revised on or before July 1, 2018 and every six years thereafter. More information about the standards review and revision process and the committee application process can be found at http://www.cde.state.co.us/standardsandinstruction/casreview. Go directly to the committee application at https://www.surveymonkey.com/r/casapplication. CDE has developed an online standards review system to enable all Coloradoans to provide specific feedback on each and every expectation within all 10 content areas of the Colorado Academic Standards. This is your chance to provide feedback directly to the committees that will be making recommendations for revisions to the standards. This is a first-of-its-kind opportunity that will only be available until April 30, 2017. The review and revision process is required by Senate Bill 08-212, known as Colorado’s Achievement Plan for Kids (CAP4K). The law requires a review and revision of the Colorado Academic Standards on or before July 1, 2018 and every six years thereafter. More information about the standards review and revision process and the online standards feedback system can be found at http://www.cde.state.co.us/standardsandinstruction/casreview. Go directly to the online standards feedback system at https://www.cde.state.co.us/apps/costandardsreview/login. In order to demonstrate that Colorado meets the requirements of ESSA and to access the funding allocated to the state, CDE must submit a plan to the United States Department of Education for approval. Fundamental to the requirements of the ESSA plan, is that the department engage in meaningful consultation with a broad range of education stakeholders in developing the plan and, once a draft of the plan has been completed, to make the plan available for public comment. The draft of this plan will be open for public comment for 30 days, beginning on Friday, February 10, 2017, and closing on Friday, March 10, 2017. Mail your comments to: Colorado Department of Education, Federal Programs Unit, 1560 Broadway, Suite 1100, Denver, CO 80202-5149. We invite you to read the letter from Commissioner Anthes on Colorado’s ESSA State Plan Development and release of the state plan draft prior to submitting your comments: http://www.cde.state.co.us/fedprograms/essapubliccommentletter. This stage of Colorado’s ESSA plan development is important as it is your chance to react to the plan. The comments we receive from you will be compiled and incorporated into the plan as appropriate. Next, the plan will be reviewed with the Governor and ultimately presented to Colorado’s State Board of Education for approval to submit to the U.S. Department of Education in April. CDE also intends to post a draft of the state plan in Spanish and encourages members of the public to contact us at essaquestions@cde.state.co.us with any questions or requests related to accessibility.